JJ: I will tell it quickly, Artie, Wayne and I went to this Chinese restaurant and we all got these fortune cookies and we opened them up and they all had exactly the same wording. This was unusual to say the least. They all said that we would have a fortune come into our hands in the near future or something like that. In other words the message was that we were really going to get rich. I thought, this is kind of interesting, so Wayne signals the waitress and says that something is wrong with these fortune cookies. We all got the same thing and that never happens, please bring us three more. So the waitress brings us three more and Artie and I opened ours and again they said exactly the same thing and Wayne’s said the same thing but with a little bit different wording. We thought, wow all the fortune cookies must say the same thing here but the waitress assured us this was a rare occurrence – that there were many different fortunes. I did not think much of it and then the next morning when I got up and put on my bathrobe and started walking down the stairs. Suddenly, quarters started falling from somewhere on the stairs! I thought what in the world, I was looking around and I thought well that is kind of odd. It happened a third time and I was just beside myself and I figured it must have been something in my robe that I had not seen or I missed something. The next day I was taking a shower and all of a sudden, plunk, right on the bottom of the shower a quarter had fallen from somewhere and I thought where did this quarter come from? I picked it up and said it can’t just materialize from out of thin air; that is impossible. So I thought to myself, this might be a real sign and I am not a big believer in sign type miracles, but this might be a sign that we are going to get rich, so I want to keep this quarter! ! JJ: Anyway, I put it aside and I started telling everybody about the miracle of the quarters and it looked like it was our destiny to get rich. Well this was about ten years ago and I am not rich yet so you can read the tea leaves here. Audience: Maybe you should have asked dollars. JJ: For about a year I believed it must be type of real legitimate sign. Until I finally discovered what happened. I got out of bed from taking a nap one time and I walked in the bathroom and looked in the mirror and there stuck on my body was a couple of quarters and then I put it together. It was not a miracle after all and I made a fool of myself telling all my friends about the miracle of the quarters. Here is the explanation… I was taking a nap with my pants on during that time period and I had a bunch of change that had fallen out and on to the bed and then when I went to bed at night, I slept on the quarters and they stuck to my body and then when I was walking down the stairs they fell off my body and when I was taking a shower one was stuck on my tummy and it fell off and landed on the floor, seemingly coming out of nowhere. JJ: I was kind of disappointed because I had told everybody about the miracle of the quarters and that it must be our destiny to get rich quick. So I was pretty disappointed and what reminded me of that again, is when I took my last shower quarters mysteriously appeared at my feet again. I do not know where they came from. Did anybody go and stick quarters in my shower within the past hour? Is somebody playing a trick on me? Audience member: When I came in the room I heard some quarters0 fall and I think they fell out of your pocket. JJ: Well how did they get in the shower because I did not have my pants on while I was taking a shower? JJ: Two quarters and I was thinking I remember telling this to somebody over the past couple of days and I thought it was Susan but I wasn’t sure. Perhaps the person I told it to is trying to pull a trick on me. Have you been in my shower? JJ: I am wondering where those quarters came from. Audience: At the Wendy’s where me, Eddie and Lorraine stopped in, I went over to get a spoon and someone left a ton of change on top of this one spoon packet over there and I just picked up the change spoon. Okay what we are going to demonstrate is something quite magical, the point we are going to show you the physical correspondence where land water and air meet. We did this at the very first Gathering and it did not work very well, after we did it about 20 times then we finally got it to work but it was very agitating and I have practiced it this time and I know it will work. But we can make mental float on water. It floats on the point which is neither wet nor dry where land, water and air meet. We are going to do it in this order here. Everybody walk up here and please don’t shake this because if you shake it, it will make it harder. We are using a paper clip and last time we used a needle and a needle works pretty good but I found a paper clip and this seems to work even better and is actually heavier than a needle. Have you ever seen a needle or a paper clip float on water? Audience: Some yes and some no. JJ: Okay we are going to make this paper clip float on water, This is so weird, it I told myself that this was not going to happen again and we are having a little bit of a problem here, again. I did this a half a dozen times at work and the tissue sank with like 6 seconds. (The paper clip finally floats) Anyway we have metal floating on water, now look at the point where air, water and land meet, it is neither wet nor dry. You have surface tension, you can see the clip floating on it and you can see the surface tension holding it. Where the paper clip is touching the water it is not wet, but it is also not dry because it is touching water. So you have the little correspondence, which is where the land, air and water meet which is neither wet nor dry. I am glad we got it to work this time, thank God. Let’s see how long it floats. Audience: So eventually this will sink? JJ: If it is not disturbed then it will go on forever. If we walk around and create some ripples then it will eventually break the surface tension. It’s funny at the first gathering we did this and I did it over and over and over and I could not figure out what the problem was until found out that I was using distilled water which has a little bit less surface tension than regular water. It is still floating and will continue until someone jumps around and disturbs it. Anyway I thought that was a very interesting demonstration here of how this corresponds to the point. Everything that is true has a correspondence on different levels and when I read rule number eight I thought now what could be the correspondence on the physical level? Then it occurred to me that we do have a correspondence on the physical level where metal can actually float on surface tension and the surface tension has to be broken before the metal can get wet and as long as the surface tension is not broken then the metal that is floating is neither wet nor dry. And the same thing with us; we create a point of tension to enter into the soul contact. And that point of tension creates a place, which is neither emotional nor mental, nor earthly, but it is pure soul energy, as DK said, this is where magic takes place. New Years Day! And the best part is that I have the day off to kick off my shoes and do anything I want. Maybe I can be awake enough here to keep the typos out of my writing since I have the luxury today of writing in the middle of the day rather than late at night. 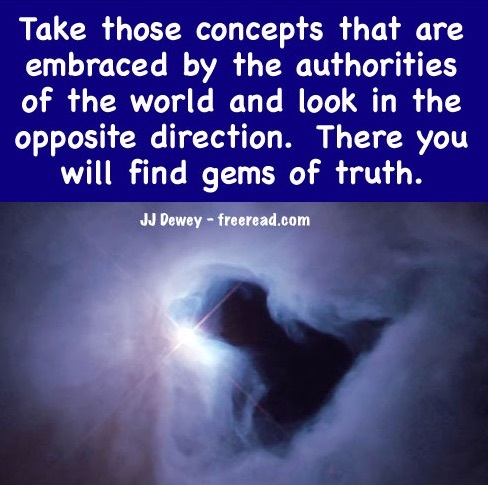 The Question… What is the ﬁrst major step toward soul contact? The answer is somewhat of a judgment call and I would say that some of the answers given could be argued as being the major one. Let me brieﬂy cover several. (1) Making a decision to seek or BECOME. This can be major except there are some who seek for a short time and then quit and then go into limbo for a few lifetimes. This then becomes the major step that was not taken. If the seeking attitude and the Decision to do so is maintained then that is a major event in the life of the soul. (2) Awareness, recognition that there is something out there beyond the physical – looking for it – looking within. (3) A point of crisis in our lives causing us to reﬂect. (4) Observing ourselves with detachment. (5) Finding a true spiritual teacher who has himself received soul contact. All of these are good points and we may expand on them later, but I want to cover an important step which occurs as the mark of the Beast is replaced by the name of the Father. What makes this possible? She is heading us the right direction here, but I would reword her statement to “within ourselves” rather than “to ourselves.” If looking to ourselves leads us to the Ego then we only have an illusion of being free from the Beast, as the ego is part of his realm. Semantics is involved here because if we ﬁnd and look to our true self who is one with God then the mission is accomplished. 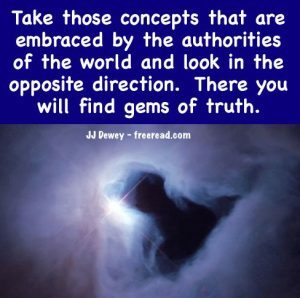 But the safer wording for the seeker, who has not yet found, is the direction to look within – implying that something will be found that has not been discovered before. If you look within and ﬁnd that still small voice then you shall have to slay the dragon who gives authority to the Beast. You will not have to look for the dragon for he will come after you in a myriad of ways and his approach will always be sensed. (1) Fear the dragon and let him immobilize or slay you. (2) Face the dragon and slay him. Then even if you face the dragon and seem to slay him you may discover you have just wounded a head, which is healed, and have to slay him again until the body of the dragon is “cast alive into a lake of ﬁre and brimstone.” Rev 20:20. The ﬁre of the Holy Spirit from God ﬁnally consumes the dragon and at last you are able to maintain your focus on the name of the Father in the forehead. The sign that you have taken your ﬁrst great step is when you show a willingness to act on a true message from within in deﬁance to all the clamoring messages from without in the face of risk of life, reputation, eternal damnation or loss. Notice I say “true message?” There are many who believe they have received a true message from the soul when in reality their action can be traced to the blind following of a guru, religious leader, book or the ego pretending to be the soul. The subtle difference is this: He who still has the mark of the Beast will either be enhancing someone else’s ego or his own, whereas he who follows the soul will always feel humbled by it. Perhaps a personal story here will help. When I was around sixteen I started reading the scriptures for the ﬁrst time and as I read I began to wonder why there are not miracles today, as there seemed to be in abundance in ancient times. The church I attended rambled on about miracles a lot, but I hadn’t ever actually seen one or met anyone who had faith to perform one. Then one day I was walking home from school and passed by a fellow student’s home that had been stricken with an incurable disease (multiple sclerosis). I stopped a second and looked in her direction. I was saddened as I watched her hobble around in her yard on crutches, barely able to move from one location to another, and in my mind I reﬂected back to how she was just a short period before – healthy and vibrant with a whole life in front of her. Then a thought occurred to me. I considered this statement and asked myself: “Do these words have any limitations to them? I am not being told that I can ask for a miracle only if I am an adult, or only if I have a position in the church, or even if I am perfect? The words of the soul that I had received merely told me that I could ask and it would be done. Play it safe and do not attempt to heal. If God really wants her healed He’ll do it without me. Why put my soul at great risk and trust the words of the inner voice which may just be my imagination. Unknown to me at the time the real risk was trusting the dragon rather than the soul but of this I had no knowledge and thus the point of tension in my mind was great. After this long moment of reﬂection where my mind seemed to go back and forth between the two decisions about a hundred times I ﬁnally settled on the inner voice. I thought to myself that I did not have a good logical reason to doubt these inclusive words and if I need to put myself at risk to help a friend then so be it. Instantly, upon completing this sentence I felt a surge of divine energy going through the warp and woof of my being to the extent I almost collapsed on the ground. This was very unexpected, for I had never associated any energy transference with miracles, and my immediate thought was that perhaps God was in the midst of punishing me by dissolving my body and soul back to the nothingness from whence it came. I used what little energy I had left to head toward home as fast as I could and did not notice whether the decree had any effect on my friend. For a while I was more concerned about my own well being than any one else’s, but after a while my state of being seemed to return to normal and I thought that perhaps God was just sending me a warning not to mess around where I do not belong. I put the experience out of my mind until about two days later. I saw my friend at school walking with no crutches. I was curious about this and walked up to her and asked about her recovery. She smiled and said that the doctor had told her that her disease went into remission – that it may not last, but she was feeling ﬁne for now. When she said this the truth then dawned on me. God was not trying to punish me. I had made the right decision after all. A true miracle had happened and the power which I had felt was some type of spiritual energy going through me into her. Evidently, I thought, this was just part of some natural process. I was just an instrument in the hands of one greater than me. I left her presence realizing that perhaps the greatest miracle of all was the knowledge that I now possessed and that from that point on I should trust the highest I receive from within more than all the voices without. The interesting thing is that at the time I had a beloved uncle who was dying of MS, but when I contemplated doing the same thing for him I felt restrained from doing so. I later found out the reason for this. That is each illness is sent to us to teach us something and that the problem can be permanently removed when the lesson is learned. My Uncle had lessons to learn from his struggle that I was not supposed to remove from him. I believe I was allowed to heal my friend more as a teaching lesson to me than anything else and it was the right thing to do because of the inward message to go ahead. Of all the sick people I have met I have only been impressed one other time to silently heal without the cooperation of the patient. She saw the puzzled look in my eyes and then identiﬁed herself. It was the same girl who had MS and was healed. I hadn’t seen her for over thirty years. I asked her about her illness and if it had ever returned. This is the basic account of my ﬁrst confrontation with the dragon of authority, but not my last. Confronting and slaying your ﬁrst dragon of authority is the ﬁrst major step for when the Spirit of God through your soul sees that you will listen to It more than the multitude of voices without then the lines of communication swing open wide. But then the problem of focus begins. The disciple must keep his attention on the Inner Light and when a communication from the soul is received he or she must learn to trust it and follow what is revealed. If he does not then the door shuts again until the message is heard and incorporated. I have written this account in the hope of giving inspiration to others to face the dragon and slay him in your own lives. So Jesus went with him. A large crowd followed and pressed around him. And a woman was there who had been subject to bleeding for twelve years. She had suffered a great deal under the care of many doctors and had spent all she had, yet instead of getting better she grew worse. But Jesus kept looking around to see who had done it. Then the woman, knowing what had happened to her, came and fell at his feet and, trembling with fear, told him the whole truth. He did not let anyone follow him except Peter, James and John the brother of James. When they came to the home of the synagogue leader, Jesus saw a commotion, with people crying and wailing loudly. He went in and said to them, “Why all this commotion and wailing? The child is not dead but asleep.” But they laughed at him. After he put them all out, he took the child’s father and mother and the disciples who were with him, and went in where the child was. He took her by the hand and said to her, “Talitha koum!” (which means “Little girl, I say to you, get up!”). Immediately the girl stood up and began to walk around (she was twelve years old). At this they were completely astonished. He gave strict orders not to let anyone know about this, and told them to give her something to eat. There is a lot to be gleaned from these verses, but will just cover several important points. How many times do we hear patients today tell this same story? People get sick and, even with insurance, they spend all they have trying to survive but often to no avail. The second thing of interest was the identity of the man who initially sought the help of Jesus. He was the leader of a synagogue. And why is this important? Because the Jewish leaders, as a whole, scorned and mocked Jesus. This would be comparable to Bernie Sanders today going to Donald Trump asking for help. The guy obviously loved his daughter and most likely, like the lady, had tried everything available to help his daughter and nothing worked. For both people Jesus was the last resort. Nothing else worked so let’s see if the crazy guy can actually do something. The lesson here is that we should start thinking out of the box before we become desperate. Those who search for answers through self-imposed motivation are richly rewarded. Those who wait until they are desperate will rarely encounter a helper like Jesus who can turn things around at the last minute. Another thing of significance is that when the woman touched his garment Jesus felt power go out of him, or through him. This tells us that there is a universal power source that can be tapped into that will stimulate healing. We must seek to be good conductors of it as was Jesus. Another point is that Jesus did not tell Jairus to go jump in the lake merely because he belonged to a group of sworn enemies. He responded to a plea for help without casting negative judgment. Then as he proceeded to assist Jairus another miracle happened along the way. The lesson here is that as the seeker willingly serves with all his strength, more strength and power to serve are made available and opportunities blossom. Finally we come to the most significant lesson. When Jesus began the journey he only allowed Jairus and three believing disciples to come with him. Then after he arrived he made everyone leave his presence except for Jairus, his wife and his three disciples. Raising the dead was a miracle few could accept and if unbelievers and mockers were present, even Jesus could not have performed the miracle. After all, we are told that he could not perform any miracle in his hometown because the people there had no faith in him. Miracles will be few and far between if you are in the midst of a crowd hostile to them or those attempting to perform them. If one person has a consciousness directed toward Spirit and finds another so directed then their power is amplified. If he finds many their power is magnified beyond belief. This principle will eventually be demonstrated in the Molecular Relationship. There are two types of people in this world: Those who believe in miracles and those who do not. Those who do not believe see all the miracles of the Bible as being fables that are passed down, and if there is any truth to the stories that there is a natural explanation for it. These people explain away modern day miracles as either something accomplished by the power of mind over matter or the story was exaggerated. It is interesting that these non-believers are in the minority. All polls show that over 70% of the U.S. public believe in miracles and over a third claim to have experienced one themselves. 63% say they know someone who claims to have experienced a miracle. For those who say these believers are uneducated consider this. 73% of medical doctors believe that miracles happen in the present time and 55% say they have witnessed one or more with their patients. So, who is right here, the minority or the majority? In this case I side with the majority. Miracles definitely occur. I personally know this to be true because I have experienced a number of them myself. Once a person experiences a thing he must either accept it or deny reality. So what are we talking about when we speak of miracles? “If we are just talking about a quick recovery from sickness, that is no miracle, “says the skeptic. (1) A terminal, supposedly incurable disease, cured quickly or even instantly. (2) Receiving some supernatural communication that warns of danger and saves a life. Here is a LINK to an example. (3) A near death experience. (4) Seeing an angel or a vision. There are many more that could be listed. Most of us have heard some pretty fantastic accounts that even stretch credibility for a believer. So, does a miracle defy the laws of nature or of science? No, they do not. Miracles happen through the application of law, not bypassing it. Imagine that you were driving down the highway and suddenly were transported back in time a couple centuries and found yourself surrounded by a group of people. They watch you drive your horseless carriage and think this is the greatest miracle they have ever witnessed. You get out of the car and show then your iPad that has a Star Wars movie loaded into it. Not only are they amazed by the iPad, but the spaceships and the Deathstar seem way beyond anything man could put in a tablet. It isn’t long before the group is arguing whether you are a god or a devil. Just as modern humanity uses electricity, engineering and intelligent application of law to produce our miracles, even so does Higher Intelligence use subtle energies and laws unknown to us to manifest miracles beyond normal human ability. A question that many ask is, “Why do not miracles happen to me?” This question is asked by a wide range of people, from the mildly curious to those who are desperately ill or distressed. It does appear to many that miracles appear somewhat randomly. It seems that many very good people suffer and die with no miracle whereas another who may not seem that deserving gets one. Since most miracles revolve around physical healing let us ask what one could do to manifest a miracle if he had an incurable disease? To understand the answer we must realizes that there are two sources of miraculous healing power. (1) Each of us has a connecting thread that links us to God, the Source of all higher power. It is possible to draw spiritual energy from this Source that will produce a miraculous healing. (2) There are highly intelligent beings in the spirit world who assist humans from time to time. If you get their attention and a healing does not violate the plan of your soul, then they can assist with a miracle. Of course, most of those who manifest a miracle in their lives have faith that God has power to help them, but there is an ancient law that applies here and it is this. Those who manifest miracles generally place a lot of positive thought, prayer and contemplation toward being healed. There is a point reached when enough energy is directed toward an end that something happens. Just like when you place a certain amount of sugar in a glass of water you will reach a saturation point where the sugar no longer dissolves. Even so, applying a certain amount of positive thought energy toward a goal eventually creates a point of tension and makes the impossible happen. We must realize though that there is a reason behind all illness and any miracle must not take away from the lessons we may learn from it. We’ll talk more about this in the next chapter. Posted in BooksTagged miracles1 Comment on Do Miracles Really Happen? The title of tonight’s class is “The Birth of the Christ Within.” Now it is interesting that wherever the name Christ is circulated it seems to create and cause a lot of controversy. Even as innocent a thing as Christmas does this. We turn on the TV these days and we see an assault on Christmas itself. There are arguments about taking the Christ out of Christmas. They want to call a Christmas tree a holiday tree and want to say happy holidays instead of merry Christmas. So even the most innocent appearance of the name of Christ is creating a controversy. It is interesting that when Jesus was sending His disciples off He said to them, “Ye shall be hated of all the world for my name’s sake.” It is interesting that where the name of Christ manifests there is controversy created. And the last element of controversy around the name of Christ seems to be the celebration of his birthday. Just even wishing somebody Merry Christmas seems to upset a lot of people these days. When I was kid it did not upset anyone you just said Merry Christmas and you did not even know about that happy holidays thing you just said merry Christmas and there was just a Christmas tree and that was it. Now there is a controversy over this very innocent sounding holiday. If you wish somebody Merry Christmas you are going to leave out the Muslims, Jews, Buddhists and the new agers like us. So it is interesting how just the name of Christ in circulation causes controversy and friction even though He is called the Prince of Peace. What happened when the Prince of Peace came? JJ: Was there peace around Him where ever He walked? No wherever He went people wanted to kill Him. So doesn’t that seem strange that He appears as the Prince of Peace and the first thing that happens is that all the authorities around Him become upset and begin to have secret little conferences as to how to get rid of the guy. Finally they crucify Him and they think they are finally rid of Him. He is dead and gone and just one more troublemaker that they don’t have to worry about anymore. Well about three days later they had to change their minds on that idea. And so it is fascinating that as the name of Christ was circulated over the ages we had the crusades and the crusades was fought over what? Audience: Fought over the name of Christ. JJ: Fought over the name of Christ and to secure the name of Christ in Jerusalem. They wanted to re-take Jerusalem and secure the name of Christ there so the name of Christ could dominate. What did Constantine see in a vision that made him want to go out and conquer the world? He saw a vision of a cross in the heavens and he heard these words spoken “by this you shall conquer.” So all of a sudden Constantine changed from being a Roman Emperor and became a Christian Emperor and he decide to conquer the world in the name of Christ. It interesting that the name of Christ, the one called the Prince of Peace creates disturbance wherever His name manifests. Admittedly it is most probable that Constantine did not receive a vision from Christ or the higher spheres but from the lower astral realm. He was probably given information from a lower vibration to go and conquer the earth. As a matter of fact he corrupted a lot of the teachings of Christ and he was one that initiated the great changes away from real truth. He told the Christians basically, look we are going to stop persecuting you if you change your doctrines to what we tell you. If you change your doctrines and teachings to the way the State wants then we will quit persecuting you. So a lot of Christians thought, well I guess that would be worth About 95% of them went along with the changes but there was a small number that thought they are not going to change and continue to teach what they have been taught. Well this small percentage that was left over were persecuted more than ever and the Empire did everything it could to get rid of this group that held out. They were hunted down like dogs and persecuted because they did not go along with the changes of the Roman Emperor. Ironically, He was called the prince of peace. Often times when He met with His disciples one of the first things He said to them was what, do you remember what His introductory statement was when He met with His disciples? Audience: Peace be with you. JJ: Right peace be unto you. What do you suppose it felt like to be in His presence and have Him say that to you? Peace be unto you. Now imagine that I am the Christ; visualize that I am He and I say to you, peace be unto you. Do you think it would feel a little bit different than if say Wayne said it to you? JJ: I’ll tell how Wayne would say it you, Hey you want a piece of me! JJ: But anyway that was His introductory statement and I believe that when He said that to them that they did feel something, they felt a presence about Him and they felt an inner peace around Him because He had such a great peace within Him self. It is interesting that when they were on the ship and this giant storm came up and the disciples were doing everything they could to save the boat from sinking – it was tossing and turning all over the place and as they were trying to save the boat from sinking they were saying, where is Jesus at – we haven’t seen Him around. They went down below deck and Jesus was down there sleeping! And they were shouting, good grief how can He sleep? The boat is tossing and turning like crazy and there Jesus is sleeping! So they wake Him up and they said Master awake and save us we are going to sink here in this great storm and you can’t be sleeping! So Jesus yawns and got up and goes up on deck and says, oh ye have little faith! Curtis: Because He was connected with the elements and the deva’s and the all the powers that be and He was the Christ. He had the power of Christ and the power of God in Him. JJ: I thought you knew the answer, darn it! JJ: When He said peace it had an affect because within His soul, the inner part of His being was a tremendous peace. The words that you speak will have no power unless that word is within you and the word peace was within Him. This was His greeting to His fellow man, peace be unto you. It had an affect because within Him was a great sense of peace, a peace that passes all understanding. Have you ever had a peace that seemed to surpass all understanding and was so great that you could really not put it into words? There is a peace that is like an absence of noise but that is kind of tranquility and not necessarily peace. Then there is a peace that goes beyond the absence of noise, what the scriptures call a peace that passes all understanding. If the person has that peace within him then when he speaks the word peace, he speaks it from his soul. Have you ever considered how it was that Jesus had the power to heal people? After Elder Eldridge went home I was sent a new companion named Elder Cooper. Now when I was with Eldridge the members called me the quiet one, but it was not because I had nothing to say but that Eldridge had a very outgoing personality and it was often hard to get in a word edgewise. On the other hand, Cooper was truly a quiet one. I tried to give him plenty of opportunity to speak but he never had much to say. The members of the branch thought that I had undergone a personality transformation as now I had to be the main person to interact and Elder Cooper was happy to let me dominate. Elder Cooper had majored in chemistry back home and one of the first things he communicated to me was that his grade average was a perfect 4.0. I remember the first time we were to teach a lesson together. The way it worked was that one missionary taught one half and the other the second half. I told Cooper that we had to teach a lesson that evening, I believe it was number three. I noticed a short time later that he was intensely involved in studying. I asked him what he was doing. He said he was studying the lesson that we were going to give that evening. This surprised me as I was only about an average student and he had a perfect 4.0. I thought to myself that with my average scholarly ability I never had to review the lessons because I had them memorized but Cooper here was the perfect student and a year into his mission he had to review his lessons. As we worked together I noticed that he could never give a lesson without first spending about an hour in preparation and review first, and I never had to review them and could give them very close to word for word. This started me thinking about what true intelligence was. Elder Cooper was the perfect student yet his emotional growth seemed to be stunted and he seemed to lack the ability to apply intelligence in a practical way. Later on a book was to become popular called “Emotional Intelligence” where the idea was presented that there are a number of levels and layers of intelligence and for making a success of yourself one has to have emotional intelligence which aids in human interaction. Something else occurred to me and which was that Elder Cooper had a good short term memory but not so good on the long term. After reviewing a lesson he then had it pretty good in his head, but he would lose it and have to review again if he had to give it a few days later. My memory seemed to work differently than his. My short term memory was not so great which explained why cramming for tests in school wasn’t a lot of help for me. On the other hand, when I did actually learn a thing I usually retain it for a long period or for life. For instance, I am writing this account from memory as I did not keep a journal. I do have the letters I mailed to my mom but they contained very little to help recall the story. I guess if I had to choose between having a good long term or short term memory I would chose long term, even though that puts one at a disadvantage in taking standardized tests. Now my wife has a good short term memory and had a good grade point in school but her long term is not so great. This kind of works well because between the two of us we have a petty good composite mind. She’ll see a movie listed and ask if we have seen it. If we have I’ll say yes and tell her what it was about. Then she may ask me if she liked it. I will then clearly recall how she felt about the movie and relate that to her. Then I will often make use of her excellent short term memory. If we both meet a new person and are introduced I will often forget the name within a few seconds. I’ll then ask her, “What was that guy’s name?” She’ll just about always remember and tell me. Then sometimes I’ll come up with an idea and explain it to her and then forget what it was five minutes later. I’ll ask her what it was and she will recall and remind me. So, as it works out between the two of us we have a fairly good brain. So Elder Cooper got me started thinking about intelligence, but I didn’t stop at examining memory or even emotional intelligence. Later on I did a lot of thinking about how intelligence works out on many different levels. I could probably write a book on the subject, but that’s for another day. Now I was in charge we set out the best way possible to establish a good pool of people to teach. It was difficult because of the age of the residents in Scarborough and the other duties foisted upon me as the District Leader. Even so, we did make some progress, but nothing like happened in Peterlee. Most of the work with Elder Cooper and the other missionaries at that time was pretty routine but still several interesting things happened. Shortly before my mission I had taken several hard knocks on the head. I noticed that the pupils in my eyes were different sizes and I had heard this was a bad sign. Throughout my mission I sensed that something was not quite right with my computer brain. Then one day we were working in an area of mobile homes and as we approached one I hit my head on a metal open window pane that I didn’t see. I struck it so hard that it made the whole mobile home shake. During the next few days I really seemed to be out of it and let Elder Cooper teach as much as he was willing. I looked in the mirror and saw that my pupils, which had been returning to normal, now really looked off size. I figured that if I didn’t start feeling better soon I’d have to see a doctor about taking some tests. Then one evening we had one lesson to teach and I told Elder Cooper to just teach it as long as he wanted. I sat in a comfortable chair and just about went to sleep. I felt surprisingly peaceful and at ease. Because of the peaceful feeling I thought I could trust whoever this was and complied. Then a most amazing thing happened. I felt their hands on my head and sensed they were spiritual physicians from the other side. They spent the first couple minutes in some type of preparation as I felt their fingers moving around on my scalp. Then after this process was finished I felt an actual instrument enter right through my scull into the center of my brain. I was surprised but not alarmed as the feeling of peace continued and again was reminded mentally to remain perfectly still. The instrument was not made of physical matter and produced no pain, but made a tingling sensation. On hindsight I would guess I was sensing it through my etheric instead of my physical body. This instrument did some probing for around five minutes or so and then another instrument was introduced. This seemed to be some kind of etheric laser and I sensed the real work of repair was now happening. Again, this produced no pain, but a rather pleasant tingling sensation right in the physical brain itself. This process took another ten or fifteen minutes and finally I sensed they were finished as the instruments were withdrawn. Shortly after this the entities left. Their presence felt so good I would have been happy to have them hang around indefinitely. After we left the home I took note of how I felt and my sense of well being was much better. Later, when I looked in a mirror, I was delighted to see that both my pupils were the same size. I took this to be a good sign. My head felt much better the rest of my mission but it seemed I did need a final repair. Right after I got home I had to head up to college at the University of Idaho, 300 miles north. During the drive I felt their presence again. Again I felt their fingers on my scalp and received the impression that that I needed a final touch up. Then for about 20 minutes I drove onward keeping my head as still as possible while they repeated a similar process to the earlier one. After they were finished they left just as they did before. After this my head felt great and the ole brain has served me very well ever since. As it turns out some people are happy with what my mind turns out and some are not but hopefully I can leave a legacy of an overall good effect. I know that I personally will always feel indebted to those spiritual servants. Somewhere around this time period we had a couple more interesting, or what some might call “faith promoting,” experiences. One evening we received a call that a sister in the branch had been in a serious car accident and we were requested to give her a healing blessing. We went to the hospital and were allowed into her room. She was in bad shape indeed for her face was so bruised we would not have recognized her if he hadn’t known it was her. She was conscious though and looked our direction and I knew she recognized us. She could not speak though for her jaw was broken badly in several locations and we were told that she was going to require some major surgery to reconstruct it. We did our best to speak consoling words to her and then laid our hands gently on her head and gave her a blessing promising her a quick healing. Several days later when we attended church we were surprised to see her there, a little beaten up, but well on the path of recovery. This quite surprised us as everyone was expecting a long hospital stay following several major surgeries. As we approached her she recognized us and we also discovered that she could now speak. “Me what?” I said curiously. “Shortly before you visited me they took X-rays of my jaw and they saw it was severely broken in several locations and would require major surgery. Then after the blessing I began healing very quickly and after a couple days they did another X-ray just before they were going to do the first surgery. “I asked him what the problem was and he said apparently there is no problem for if the second set of X-rays are accurate the bones in my jaw have moved perfectly into place and no surgery will be required. We were thrilled with her story but that was not all. When visiting with her a month or so later she related one more thing. She said the dentist had taken an X-ray and after examining it asked her if she had ever broken her jaw. She then related the recent accident. He then said that he could barely tell that her jaw had ever been broken for the pieces were knitted back together with more exactness and precision than he had ever seen before. There was only a very slight hairline witness that her jaw had ever been broken. Another lady in the branch was having major problems with pernicious anemia and was at the end of her rope and confined to her bed. She had received several blessings from several elders but was no better. She asked us for another. When we laid our hands on her head I did my best to tune in to the Spirit and discern as to whether she could be healed. I didn’t sense any go-ahead so I just gave as encouraging of a blessing as I could. We saw her a few days later and were not surprised that she was no better. She then requested another blessing. We gave her one but again felt no go-ahead. A while later we visited her again and she was worse than ever. She requested still another blessing. This time I felt a different direction was in order. I took her hand and told her that even though she had not been healed that I did receive the reason for this. I told her hat her faith was at a low ebb. She then insisted she had lots of faith. She agreed and as we left, for the first time I saw real hope in her eyes. I do not recall whether we fasted for two or three days but I do remember that my own personal faith also had an increase because of it. When we visited her again she said that she had been thinking of what I said and that she now saw that her depressed state was indeed getting in the way of healing and that she felt that her state of mind was much better. I told her that was encouraging and we laid our hands on her head ad gave her another blessing. This time the feeling I had was different and I felt permission from the Spirit to give her a positive healing blessing. I didn’t sense a powerful spiritual feeling as we left and was hoping I had said the right thing. That evening though something strange happened. As I laid down to go to sleep I felt a powerful spiritual presence and suddenly as clear as a bell I saw the inside of her body. I saw that there was a great sore or wound near her stomach and this was draining her body of energy and its ability to heal. Then I saw that this sore was being closed up and would be as if it never was. I then went to sleep and slept sound as a baby. I never saw her for a while after that but then one day at church there she was. I saw her cheerfully talking to friend and approached her, telling her she looked pretty good and asked her about her recovery. She said she started feeling better right after the blessing that the doctor had given her a clean bill of health and the pernicious anemia was healed wad no longer a problem. As an ending thought let me add that spiritual healing is not an exact science. It would be nice if we could do a ceremony or speak certain words and always get a result, but it doesn’t work that way. There are many factors involved and sometimes no matter what you do the person may not be healed. That can be troubling for all involved. Even so, I have seen enough miraculous healing in my life to know beyond any doubt that when higher will gives approval that there is nothing impossible for us. May we always be open to all possibilities.